Looks like a painting, but it's a real gal, in a real dress. Being an author of Elven romance novels, I love fantasy weddings. This is my resource page for those contemplating the loveliness of an Elven, Elvish, or fairy wedding. Unless I say otherwise, I have no business connection with any of these companies, and being on this list does not represent a recommendation or endorsement from me. Don’t forget to search eBay and Etsy on fantasy wedding dress and Renaissance wedding dress. Rossetti Couture (UK): Check out the Pre-Raphelite and Medieval dresses, as well as the William Morris Collection. Then click on Sample Sale and pray. FancyFairy.com has some very affordable high-end wings. She also has a DeviantArt site, which should give you an idea of the custom work she can do. Enchanted Costumes also has beautiful wings, in both cellophane and fabric. Artof Wings.com is an incredible site. You fairy-wedding fans are going to squee with joy. Etsy and eBay are also good sites to check for these things. Fairy crowns at ArtofWings.com. Lots of good stuff on this site. Don’t be afraid to get a plain shoe and dress it up with trims, jewels, flowers, and some really strong glue. Probably not hot glue. Nothing is more depressing than leaving bits of your wedding ensemble behind as you walk down the wooded aisle. Calligraphic Studio Scroll down some for the official Elvish ones. Do a search for early music in your locale. These folks often dress in period costumes which work well, and can be hired at a reasonable price. Elves are very big on live music. 2010 FairieWorlds festival page has a bunch of musicians listed. Music will play when you open the page. Plus, it looks like a really cool event. 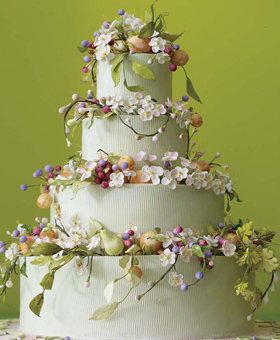 I recommend searching on fantasy wedding cake plus your location. Then click on images. Then print out your favorite and take it to a cake-decorating friend with the promise of eternal gratitude and a gift certificate to the local day spa. If you have the $ and are in the right area (NE), Wildflowers by Lori does some pretty stunning work. If you’re in Colorado, then I can personally recommend Blue Moon Cakes. I did find some lovely fairy cake toppers. If you’re part of a fantasy community which will comprise most of your guest list, consider having a potluck wedding and asking that people bring food instead of gifts. That way, you can invite as many people as you like, and none of them have to worry about shelling out for an expensive present. You can save your budget for the decor, music, beverages, flowers, etc., so it’s a really beautiful event for everyone attending. Mead is a great beverage for an Elvish/Elven wedding. Search on mead and your location to find retailers of commercial mead. Alternatively, six months to a year before the wedding, find your local homebrewing store or association, and ask if anyone there wants to brew mead for a wedding. Expect to purchase all the raw ingredients, then ask what else you can do for them in terms of barter, etc. (It’s probably illegal to pay for the finished product, but I leave this up to your own discretion.) The brewer may do it simply in exchange for the materials and an invite to the wedding. Homebrewers are extremely generous people, usually men, usually with a weakness for wedding guests wearing lovely, flowing gowns. These have hearts in the design.They're a bargain for a set of two, including free engraving. Same thing, different pic, different vendor. Did you know that you can rent plates, glasses, and silverware? Call standard rental places in your locale. If you want to use decorative paper goods, remember that it’s only one day out of your lives. Forgo any guilt. How many napkins do you need? Illuminated Garden LED flowers – I have yet to see a photo that does these justice. If you have a florist or hardware store that carries them locally, go see for yourself. The plum blossoms are particularly lovely. Considering what you pay for real flowers, these might even save you money, and they’d be great bridesmaid gifts if you didn’t want to keep them all afterward. I also like floating flower candles, but no one is going to catch their hair or sleeve on fire on an LED flower. Thinking of getting married on a horse? Stay in a Treehouse for your honeymoon! Free Spirit Spheres: The coolest-looking of the treehouse accomodations. If you found this page helpful, consider linking to it, so it can move up in searches and help other people. Thanks, and have a wonderful wedding! This is an awesome list! I may have a few more to add (need to look for them though hehe) 🙂 Thanks tons for this post, I will share with others! I happen to have a few of the same things linked on this wonderful bookmark/shopping page thing called Kaboodle (to which I’ve given my wedding folder address in the link space above), and (somehow) seem to have found a few things that you do not have here. If you’d like, you’re welcome to raid my link collection there, and thanks so much for providing such great links here! Thank you for all the information. Although I am finding it a bit difficult to find a dress. Sadly, lots of the above links are dead, so I thought I’d comment here, in case folks wanted some more ideas. My Kaboodle name changed to “Ylluria,” plus you can find me on Pinterest under the same name.